I received a sample of Regular Coffee to review. Their stated goal is to provide people with quality coffee at a decent price through a mail-order service. I drink coffee on a daily basis, and I usually buy coffee at the grocery store in the 12-oz foil bags. I'll buy one of several brands, although there a couple I avoid because the quality is not there. I also try to avoid that one major brand that advertises with mermaids, but I will admit to buying it sometimes when there is a super good coupon. So that's the range/quality we are talking about at my house, and I think we're Regular Coffee's target demographic. Overall, despite some eye-rolling on my part about the whole "regular" concept, I do think this is a good product. The coffee comes in this very "regular" looking tube that may or may not have been designed to look regular by someone with a graphic design degree from an expensive liberal arts college. The back of the canister has basic brewing measurements, which is very helpful. There is also a long paragraph on the back of the canister basically about how this is coffee for "regular" people, not hipsters, which just makes them sound more like hipsters. When regular people design stuff, it looks like my blog, not all retro and cool like this. Nothing special about me! I am just some regular old coffee! Snark aside, I actually like the design of the package. I am kind of into the retro look right now in my own kitchen, so it works. I just think it is designed to look like my grandparents would be into it, and my grandparents buy coffee from a can in the grocery store. 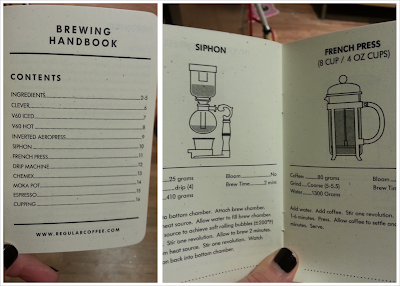 They also included a cute little booklet that was possibly designed by the same highly-educated designer, and includes very regular coffee making techniques like a "siphon," which I have never seen before other than on the Cooking Channel, and a French Press, which I am convinced people just talk about but never really use. It also describes the coffee in terms of "grams" which - who in the U.S. measures things this way? Overall though, the booklet is pretty entertaining and useful, and I will keep it in my cookbook collection for use in the future. I just wish they wouldn't keep trying to convince me that they are just regular folk. 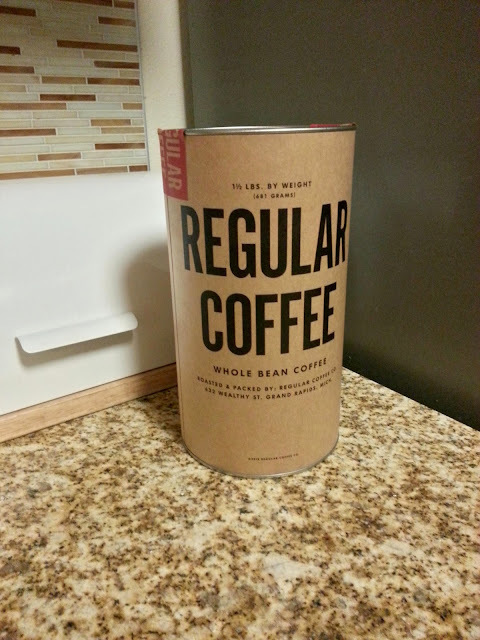 So I think we can safely say this isn't just "regular" coffee. At $20 for 1.5 lbs, it's a little pricier than "regular coffee," but comparable in price to the nicer brands you can get at the grocery store, which is what they seem to be going for based on the very hipster-cute marketing video on their site. If you are a coffee drinker who likes "nicer" coffee and are looking for a non-mermaid option, it would definitely be super convenient to receive these tubes of beans on a "regular" basis if you lived in an area where you didn't have access to quality coffee, or even just don't like shopping and want to check this off of your list. Personally, I live in Seattle, where we have an abundance of options in every single roast and price range. I can walk across the street and get some local roasters' coffee for a bit more than Regular Coffee, or a block down the way to a grocery store where I can get the foil packs of several major brands for a bit less. I am also more into dark roasts at the moment. So I probably won't subscribe. But if you like medium roasts and convenience, this is a great option for you!